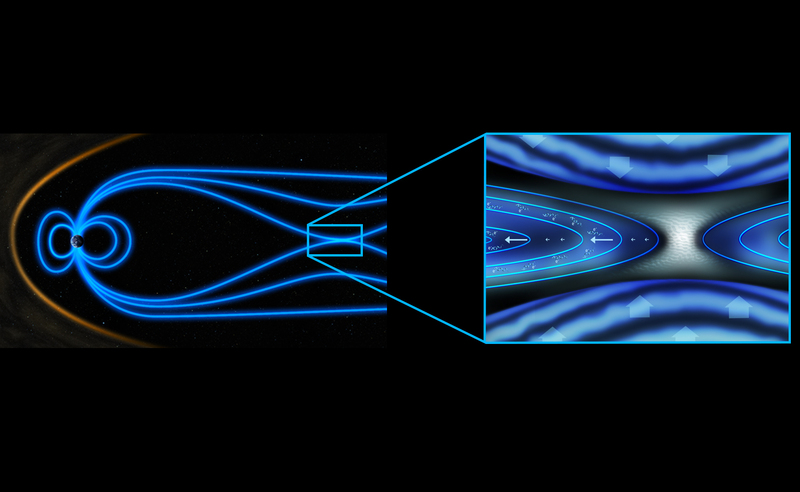 This illustration shows the configuration of a region, in the tail of Earth's magnetosphere, where magnetic reconnection is taking place. Two flows of plasma with anti-parallel magnetic fields are pushed together, flowing in from above and below. This creates a thin current sheet. As plasma continues to flow towards this sheet, particles are accelerated and eventually released via two symmetric jets: one towards Earth (to the left in the image) and another in the opposite direction. Magnetic reconnection is an efficient mechanism to transfer the energy stored in the magnetic field to the kinetic energy of particles in the plasma. Scientists, using data from ESA's Cluster mission, have discovered that magnetic reconnection can accelerate electrons to very high energies, as long as reconnection happens at a variable pace rather than steadily. Unsteady reconnection can be caused by temporal variability in the speed of the inflowing plasma that triggers the process, or by turbulence that develops directly in the magnetic reconnection site.